Yamaha YAS-207 review | What Hi-Fi? Let’s give credit where it’s due to Yamaha. While a large slice of its home theatre market is geared towards AV receivers and speaker packages, it has also long sympathised with those people who don’t have room for full surround sound systems. By creating YSP (Yamaha Sound Projection) technology – designed to emulate a surround-sound experience from a single soundbar – the company offers a reasonable compromise between performance and practicality. Yamaha’s YAS-207 also attempts to create immersive ‘virtual’ sound, only this time by using DTS’s latest codec: DTS Virtual:X. This aims to simulate sound delivered by a 7.1.4 set-up (quick maths tells us that's 11.1 channels). It works on a different basis to surround-sound codecs such as DTS:X (and Dolby Atmos). While DTS:X is natively encoded on a disc’s soundtrack, DTS Virtual:X is a post-processing algorithm that can be applied to old and new content alike (as long as it has a DTS codec). The technology has been created so people can enjoy all the height and surround sound effects, but with just a soundbar. The Yamaha YAS-207 is the first soundbar to put it to the test - and it proves a good advert for the technology. While the bar has optical and 3.5mm inputs, we choose to go through one of its HDMI sockets - which enable 4K and HDR passthrough. At this point we should note this Yamaha soundbar (and the onboard DTS tech) is no miracle worker. It doesn’t make soundtracks appear as if they’re being blasted down from your ceiling or from behind your sofa. But as far as ‘virtual’ surround-sound experiences from a single enclosure go, the YAS-207 is hugely effective. Its performance defies the bar’s physical proportions. It pushes the sonic field past that of its rivals, proving both more spacious and more enveloping too. We play Ang Lee’s Billy Lynn’s Long Halftime Walk on Ultra HD Blu-ray and, when watching the NFL half-time show there is a definite sense that it’s live – the crowd has an obvious presence, and it makes more of the echo around the stadium than our current Award winner, the Q Acoustics Media 4, can. You don’t need the ‘surround’ mode on – in fact, we find ‘stereo’ offers the most favourable balance and direct focus – but you can experiment with the seven sound modes through the basic Yamaha HT Controller app. There’s plenty of space to occupy in the soundfield, and the Yamaha manages to fill it with subtle, layered detail – to the point where there’s even obvious definition to car tyres going over rubble. Even among the music and crowd, the background details (such as people talking backstage) can be heard. But it doesn’t get bogged down with details so much that it forgets how to have a good time. There’s plenty of dynamism and crispness to the show’s musical performance, the Yamaha demonstrating tight control over the drum rolls and punch to the cymbals. Its talent is confirmed when playing the psychedelic rolling rhythms of Travis Scott’s Butterfly Effect via Bluetooth. Good news for those looking for a soundbar as adept with music as it is movies. The higher frequencies aren’t the last word in refinement, though, and mids aren’t quite as solid as they are through the Q Acoustics Media 4. The Yamaha’s frequency range isn’t quite as well integrated as the Media 4’s either. But the Yamaha’s presentation is still tight and tonally even, and we like the extra bass extension – which is a gap in the Q Acoustics’ armoury. We find ourselves more involved and absorbed by the greater expression and dynamic liberation (especially through the midrange) offered by the Yamaha. It unveils far more of the inflections in Vin Diesel’s commands to his soldiers, and voices in general are projected with greater clarity. We never feel the need to make use of the Yamaha’s Clear Voice in this instance – we prefer the balance as it is – but ,if you want a midrange boost during dialogue-driven programming, it’s effective. 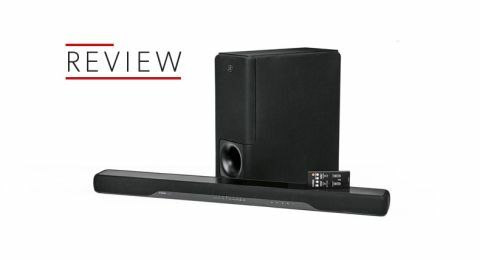 Yamaha has enough experience in the market to know a soundbar will probably sit beneath a telly in most people’s set-ups. The bar is only 6cm high, so most TV screens should easily clear that, and it’s inconspicuous in its design too. It's a black bar with a few indicative lights to show source and surround type selection. Even then, they don’t shine too brightly and can be turned off via the basic-but-easy-to-use remote control. The external subwoofer is a lot less inconspicuous, but at least it’s reasonably slim - and, of course, its positioning is less critical. With a multitude of soundbars competing in the budget-to-midrange market, the fact the Yamaha YAS-207 manages to excel in some areas of sonic performance that others don't makes it pretty special. The YAS-207 is a natural entertainer, and another chapter in Yamaha’s soundbar success story.